Watch a singer perform "Nymphs and Shepherds"
Mary Ann sings this song in the story. See a singer perform "As when the dove"
Another favourite song sung by Mary Ann. A young woman sings "When Daisies Pied and Violets Blue"
Mary Ann performs this song at the school's concert. Watch a choir sing Handel's "God Save the King"
The concert at Ranelagh Gardens ends with "God Save the King". Zoom in on a scene from "The Beggar's Opera"
This was a popular opera during Mary Ann's time. Click on "Preview" below the album cover to listen to excerpts from "Symphony No.1 in E-flat major". This painting is from around 1780, fifteen years after the Mozart children were in London. The Mozart children performed at the Rotunda in 1764. Use the zoom tools on the right to examine the painting. Chelsea was a village outside London during Mary Ann's time. Jenny wore pockets beneath her skirt when they went to Ranelagh Gardens to sing. Click on the first image to see a larger picture then click on the arrow to see the next image. Click on the first image then click on "next". Click on a topic for more information or choose more facts in the top menu. Mary Ann's father would go to a coffee house to do business. Mary Ann's father invested money in a ship that bought slaves in Africa and sold them to sugar plantation owners in the Caribbean. An enchanting story of dreams and determination, set in the colourful world of eighteenth century London. The Historical House series charts the life and times of girls who lived in 6 Chelsea Walk in some of history's most fascinating periods. Includes internet links to websites where readers can find out more about Mozart and eighteenth century life. Mary Ann’s greatest wish is to become an opera singer and she’s thrilled when she gets the chance to see child prodigy Mozart perform with his sister in Chelsea. But when her father loses his fortune, she fears her singing dreams may be shattered. Visit the author’s website, www.annturnbull.com, for more information. Following three books published in 2004 by Turnbull, Adele Gèras and Linda Newbery about girls who have lived in the same house in different periods, this is one of the next trio in the series 'Historical House'. In this story, the house is a girls' school, and Mary Ann one of the small number of pupils, studying Deportment and other accomplishments as well as French and Geography. She has a good soprano voice, and is soon selected for the end-of-term concert, and life is very pleasant, until her father's ship goes down with its valuable cargo of slaves (which makes Mary Ann feel rather vaguely uncomfortable), and she is told that the family can no longer afford to keep her at school, although her brother's education will continue. 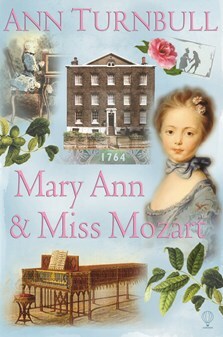 The Miss Mozart connection is very slight: there is a school outing to Ranelagh Gardens, where the young Mozart children are playing, and Mary Ann, entranced by the children's skill, discovers that the girl's name, Nannerl, is short for Maria Anna: the title serves more to place this story in its historical context. Her ticket to Ranelagh, which she treasures as a souvenir, becomes stuck in its hiding place in the panelling, and will evidently be discovered in a later period by a girl in another book. The story flows well, with touches of humour in home and school life which will appeal to girls at KS2, and at the time they will be learning about life in Georgian England. The Historical House books are immaculately researched, engagingly written and quietly educational and this one includes links to websites where readers can find out more about Mozart and eighteenth century life. I enjoyed this novel, it is the first one of the series that I have read. I really love history and so thought this was a perfect book for me. I couldn't put it down it was a great book. I am now reading Lizzie's wish. This book was great I couldn't put it down and was devastated when I forgot to take it to school. I think this book is amazing and has lots of detail about the past. I love how when you finish a chapter you can't put it down you just have to carry on.I can't wait to read the rest of the historical house sequels.